Prior to the Internet, forms of social expression, communication, and collaborative behavior are known to be sensitive to cultural nuances. According to researcher Geert Hofstede (1991), a widely used definition of culture is proposed where “Every person carries within him or herself patterns of thinking, feeling, and potential acting which were learned through their lifetime” (p. 4). Hofstede referred to such patterns as mental programs or “software of the mind.” It is expected that such mental programming related to cultural differences will affect perceptions of the electronic medium as well (Raman & Watson, 1994). Related to the topic of this volume, culture has a place in the consideration of e-collaboration when individuals come together to work toward a common goal using electronic technologies. This may include various domains including e-business, e-learning, distributed project management, working in virtual teams of various forms, to name a few. While there is little work to date on the explicit topic of culture and e-collaboration, there is evidence that creating culturally appropriate user interfaces (Cyr & Trevor-Smith, 2004) contributes to a better perception of the interface (Kondratova & Goldfarb, 2005), and indeed to enhanced levels of Web site trust and satisfaction (Cyr, 2006). In e-commerce settings, Web sites that are perceived as appropriate to the user have also resulted in greater commitment (Oliver, 1999). 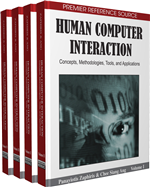 In this article, and building on previous work in related areas, it is argued that the development of culturally appropriate electronic interfaces can enhance user involvement, ultimately resulting in enhanced e-collaboration. In the following sections, culture as a context for e-collaboration is outlined followed by considerations of the Web used as a communication tool, and how trust and satisfaction are related to the online collaborative process. The article ends with concluding remarks.